A call to Quentin Lowe at Simpson Marine in Thailand brings forth the news that the company acted for both buyer and vendor in the recent sale of the 29m Phinisi sailing superyacht Song Thai. As Quentin says, "To be honest, not an amazing sale, but these boats sell reasonably easily in this region." 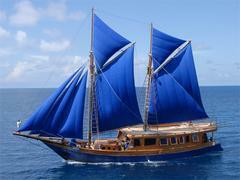 Built in 2007, Song Thai sleeps 12 guests in seven cabins and was asking €480,000.